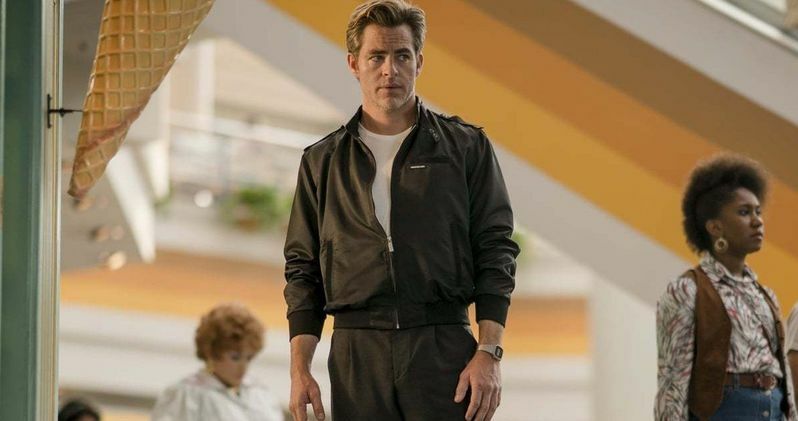 A rumored Wonder Woman 1984 plot leak explains how Chris Pine's Steve Trevor returns to the fold. Director Patty Jenkins and star Gal Gadot revealed that Pine was involved in the sequel back when production first started, releasing a photo of him in some 1980s clothing. Since then, we've seen some leaked videos and photos from the set, but we've yet to truly learn how Trevor comes back, and in the 1980s. A new plot leak, which has not been officially confirmed, attempts to explain Trevor's return. There could be potential Wonder Woman 1984 SPOILERS below, so read ahead at your own risk. According to the latest Wonder Woman 1984 plot leak, Steve Trevor's return revolves around Pedro Pascal's mysterious character. The actor's character has yet to be officially unveiled, but many are under the assumption that he is playing DC villain Maxwell Lord and this plot leak seems to confirm this. In the comics, Lord is a powerful businessman with aspirations of something much bigger than the world of business. In his quest for power, it is believed that he helps to bring Steve Trevor back to life. In addition to Pedro Pascal, Wonder Woman 1984 introduces Kristen Wiig as Barbara Minerva, aka Cheetah. In the sequel, it appears that Pascal's Maxwell Lord is on the hunt for rare ancient magical artifacts that will make him more powerful than a god. It's during this hunt that he hooks up with Minerva, who helps him on his journey until their relationship goes sour when an artifact curses Minerva, transforming her into Cheetah. Lord now has to worry about Cheetah coming after him, so he reaches out to Diana Prince for help, promising to bring Steve Trevor back from the dead in return. Obviously, this is just a rumor at this time. We still have over a year to go before Wonder Woman 1984 hits theaters. Production finally wrapped on the sequel last month and the release date was pushed back to a summer 2020 release. While we have a ways to go, the plot leak does seem to fit into previous rumors and bits of confirmed information that we have received over the past several months. With that being said, anything is possible at this point in time as to how Steve Trevor and Diana Prince reunite. Wonder Woman 1984 hits theaters on June 5th. The DCEU currently has a major hit on its hands with James Wan's Aquaman, which recently crossed the $1 billion mark at the box office. The movie has been a monster at the global box office and sets the stage for the highly anticipated Wonder Woman 1984. Before then, Shazam! opens in theaters, which looks like it will be a fun addition to the world of DC Films. The Wonder Woman 1984 leaked plot information comes to us from We Got This Covered.